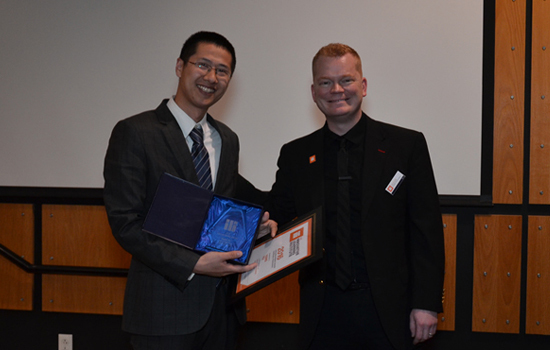 Yang Yu, an assistant professor of management information systems, accepts an award for Best Student-Created Assignment at the first Innovative Learning Institute Instructional Media Awards held April 6. Rochester Institute of Technology faculty and students were honored in a ceremony April 6 for their work using media to enhance the student experience. The first Innovative Learning Institute (ILI) Instructional Media Awards highlighted those who use video and other media in creative and effective ways, for courses taught at RIT. Six winners were selected in different categories, while more than 30 instructors were honored for their use of media in classes. Media, including videos, podcasts, voice threads, animations and 3D graphics, have become popular tools to engage students among instructors of traditional classes. Media are also used for newer teaching formats, such as blended courses, flipped classrooms and online classes. The “mini-Oscars,” hosted by RIT’s Innovative Learning Institute, were created after members of the organization began to notice the wealth of media content being developed at RIT. Also highlighted were Colin Mathers, a lecturer in the Department of Philosophy, who has been creating short animations to help explain and illustrate fundamental concepts, and Kelly Norris-Martin, assistant professor in the School of Communication, who submitted a student podcast. The ILI was created in 2012 to coordinate the development, adoption and promotion of effective teaching and learning in higher education at RIT and around the world. ILI’s two units—RIT Online and Teaching and Learning Services—are integrated to bring the latest practices to learning online and in the classroom. Teaching and Learning Services is for faculty interested in designing courses, applying appropriate academic technologies, developing media and using classroom technology resources. The ILI also has a production studio, equipped with 4K video cameras, a green screen, automatic captioning services and other tools, for faculty to record their instructional sessions. For more information about RIT’s Innovative Learning Institute, go to rit.edu/ili.